The Kelut volcano on Indonesia's Java island erupted late last night. While disaster-management authorities are busy on the ground, satellites are tracking the major cloud of ash and sulphur dioxide as it spreads in the atmosphere. "The ash has reached high altitudes where commercial aircraft fly and is a significant hazard to aviation," said Fred Prata from the Norwegian Institute for Air Research. Airports across Java have closed, and multiple flights have been cancelled throughout the region. "ESA and its partners are maintaining a constant vigil, and are providing satellite alerts to the relevant authorities through the Support to Aviation Control Service," said Mr Prata. The Support to Aviation Control Service – or SACS – uses satellite data to provide early warning information about ash, sulphur dioxide clouds and their dispersion following volcanic eruptions. The presence of ash in the atmosphere can endanger jet engines. When an eruption occurs, SACS sends a notification to users, most notably to the Volcanic Ash Advisory Centres (VAACs), and public maps are generated showing the extent and intensity of the volcanic plumes. 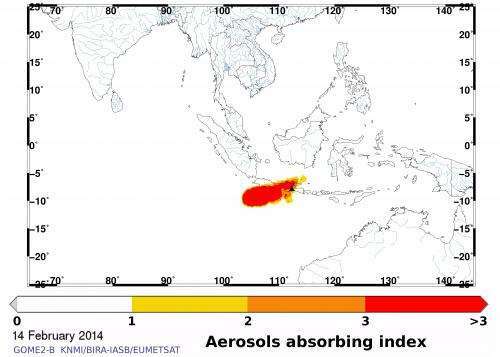 "The VACC in Darwin, Australia – which keeps track of volcanic eruptions mainly in southeast Asia – have been using satellite-derived sulphur dioxide and ash information as a verification tool for many years and are now tracking the plume from last night's eruption," said Andrew Tupper, head of Australia's National Operations Centre at the Bureau of Meteorology. "The sulphur dioxide imagery from this eruption is very useful indeed." 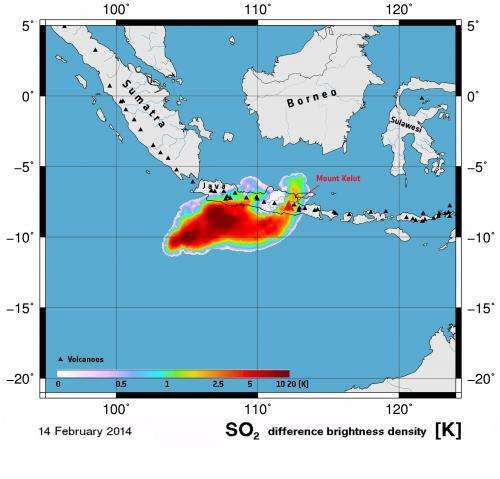 Data from the GOME-2 and IASI instruments on Europe's MetOp-A and -B satellites have been crucial to the monitoring of the Kelut eruption's ash cloud. IASI and GOME-2 – the Infrared Atmospheric Sounding Interferometer and Global Ozone Monitoring Experiment-2 – provide information about sulphur dioxide and aerosols.